The TEN AND GO project started as a family company in 2012 and created in honor of Luis and Emilia by their children José Luis and Miguel Ángel González Aragón Castellanos. The delicious mixture of fine chilies combined with onions, garlic and sesame seeds was created more than 100 years ago and has been passed from generation to generation. “Everything that is good will always find its way through time, and our company is committed to provide a quality product that keeps the scent and flavor of traditional Mexican cuisine with a gourmet touch”. This recipe is from the scenic town of Tenango del Aire in the State of Mexico. 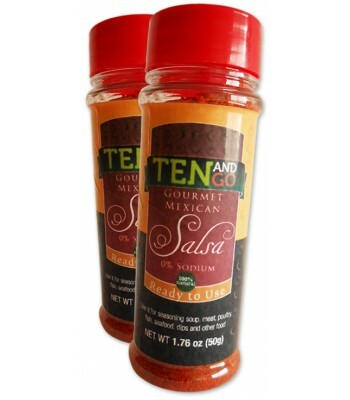 This was the inspiration for the name “TEN AND GO”. This salsa is made out of dried and powdered chilies, garlic, onion and roasted sesame seeds and was their grandmother’s recipe made with a type of chili that is not very well known but that gives it a unique flavor.